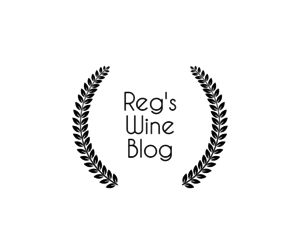 Reg’s Wine Blog – Post # 55, Some Holiday Tasting Notes, January 24, 2018. Holidays at my place are usually social gatherings with families and friends, and often provide ideal occasions to break open a special bottle. At my place, you have to pick and choose your time to open a special bottle because there is often too many people to share the bottle with. Let’s face it, a special bottle worth north of $200 does not go very far with 10 people or more. Two ounces is just enough to get a good taste, and that’s it. In fact, inhaling too hard could leave you with nothing but fumes in the glass, gone before you realize what happened! 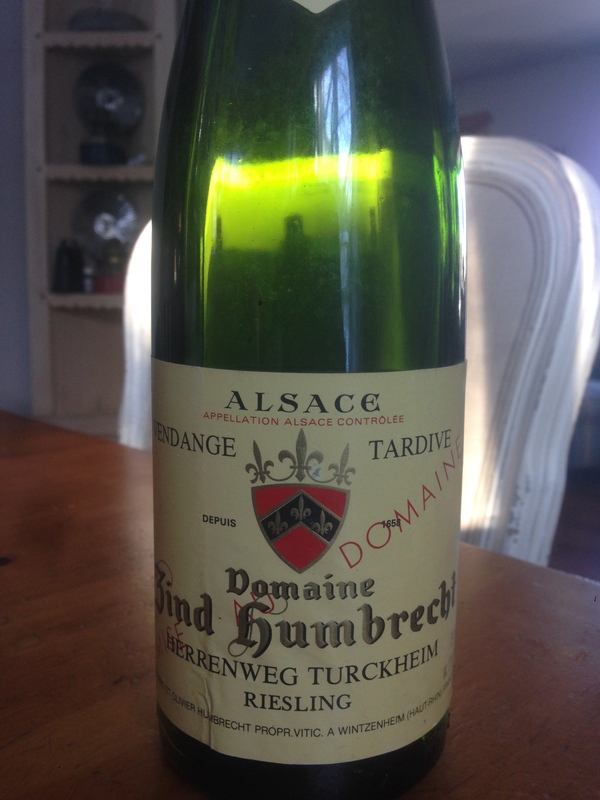 1990 Zind Humbrecht Herrenweg Turckheim Riesling Vendange Tardive – tasted December 10, 2017. 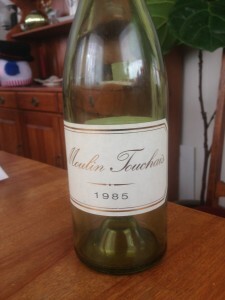 Rieslings made from their Herrenweg Turckheim vineyard are excellent when young, so I was a little surprised that at 27 years of age this wine was fabulous, still tasting young and vibrant. Orange marmalade on the nose and palate, with lots of caramel, lemon/lime spritzer, and juicy ripe melons. Round, full and chewy on the palate, not weak and not acidic. Just full of life, no rough edges, no sign of any fading. This was an excellent, fully mature late harvest Riesling showing no signs of fatigue or decay. I would rate this wine at 93 points and give it easily another 10 – 15 years of life ahead of it. If you have a bottle of this beauty in your cellar and you are in no hurry to drink it, you can safely sit on it until 2020 and try it on its 30th birthday! We tasted this wine while we decorated our Christmas tree, a fine choice for a suitable family occasion. 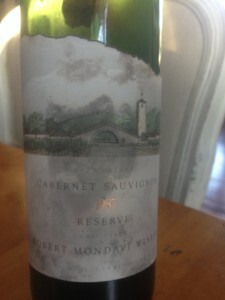 1987 Robert Mondavi Cabernet Sauvignon Reserve – tasted December 16, 2017. This is my daughter’s birth year wine, and since her birthday had happened three weeks earlier without much celebration, six of us decided to try a bottle as we had some concerns the wine may be over the hill and in decline. This is still a very good California Cabernet Sauvignon, the cork was nice and moist, with lots of cherries, cedar, and light oak on the nose. On the palate the wine was soft and delicate, tasting of smooth dark chocolate leading to a minty, mineral, tangy finish and aftertaste. Once upon a time Robert Parker had rated this wine at 97 points in 1994, and today WineSearcher.com gives this wine a combined current rating of 92 points, which I agree with. Recent tasting notes still rate the wine highly, but fully mature and ready to drink now. There is no doubt that the wine is fully mature, and will only decline from here, but the real question is when. This wine could remain in its current state for another 5-10 years, but a good rule to follow if you have more than one bottle of this wine in your cellar would be to try this wine annually from here on. A great reason to try more frequently! 2015 Caves de Ribeauville Pinot Gris Vendanges Manuelles – tasted December 29, 2017. I suggested this wine in my blog post # 52 circulated on December 8, 2017. This wine is available at the SAQ in Quebec at $20.30 per bottle, product # 11601670. Just to show you that I do drink wines that I recommend, and that not all my wine suggestions are exotic or pricey, I did try a bottle of this over the holidays. This is a lovely Pinot Gris from Alsace, not sweet, not pricey, and not overly complicated. 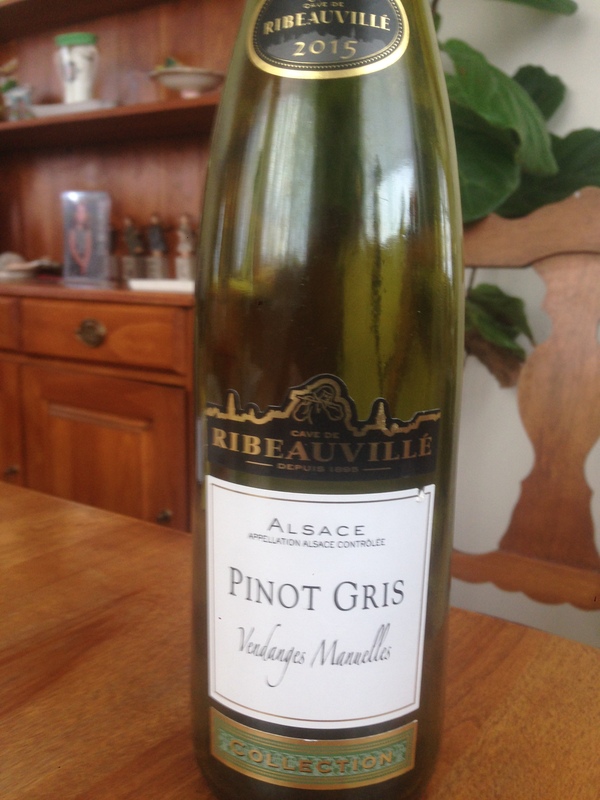 The wine was medium sweet with smoky aromas, dried fruit, fresh apricot and peaches, leading to a spicy finish. The smoke and spice in the wine offset most of the sweetness in the wine itself, leaving you with the overall impression that the wine is only just a little sweet. 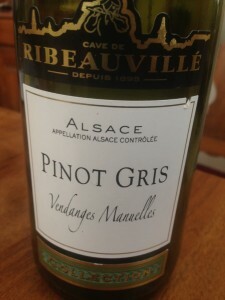 An Alsace Pinot Gris wine is usually very satisfying to drink because any residual sweetness in the wine is offset by the smoke and spice from the Pinot Gris grape, and this wine does just that. The wine is very nicely balanced, and drinks very well right now for a recent vintage. My impression of this wine is that you get great value for the price, and you can drink it right away. So if you want to buy any of the wines from this post, this would be the one to get. 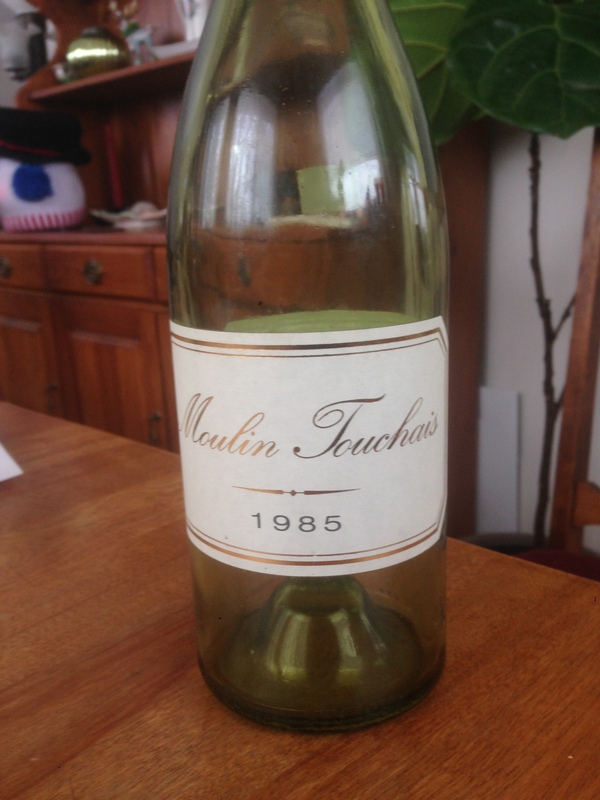 1985 Moulin Touchais – tasted December 31, 2017. If you want to know more about Moulin Touchais wines, I urge you to read my earlier blog post # 14, dated April 19, 2016. In that post I cover a lot about the winery, their owners, their production method, why the wine is so incredibly balanced, and how long lived the wines from good vintages can be. 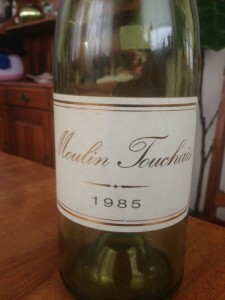 There is no doubt that 1985 was a great year for Moulin Touchais, and my post # 14 gives detail of my tasting notes of the 1985 vintage from a tasting previously conducted in November 2013. So after 4 years I figured it was time to try the wine again. The wine is a dark golden color, with huge viscosity illustrated by the long legs or tears that flow ever so slowly down the inside of the glass. Aromas of orange marmalade, apricots, caramel, and spices tease your senses and promise more to come on the palate. Once in your mouth you are immediately aware of the sweetness, yet perfectly balanced with an acidity that leaves you refreshed rather than overwhelmed. On the palate you get the same principal taste sensations of orange marmalade, apricots, caramel and spices, but you also get a light smoky taste, and the spices warm your throat. The freshness and purity on the palate is very uplifting, and the spices finish with a tangy aftertaste to them. This wine is well built, well structured, and perfectly balanced. The longer you dwell on this wine by revisiting the aromas with another swirl of the glass, and another taste, the more impressed you get with the wine’s depth, the wine’s power, finesse, and complexity. The taste experience is beguiling, makes you feel as if you are being seduced – yes, that good! Comparing my tasting notes from 2013 the only difference that stands out is that the 2013 bottle showed more aromas of orange peels verses the orange marmalade in 2017. This makes sense, the wine is evolving, and the orange aromas are becoming more complex and more integrated into the overall expression on both the nose and palate. There is so much going on in this wine, it really does command your attention. In 2013 I rated this wine at 93 points, today I give it 95 points, and it should continue to improve for the next 5 years. As it improves with more age, different aromas and tastes will emerge and gain prevalence, making it worth the wait. It is no accident that I tasted this wine on New Year’s Eve, my wife and I spent a nice quiet evening together at home. Another wise choice as there was lots more wine to go around between just the two of us. I recorked the empty bottle and when I uncork it again (as I have a few times since then), the few drops left in the bottle continue to dazzle the senses, reminding me of that great tasting experience. So these were my tastings of note over the holidays. As you can see, what to taste, when to taste, and in the presence of who’s company, are all important components that go into the overall success of the tasting experience. You can also see the importance of having good cellar storage conditions so that you can count on that older bottle being in pristine condition. 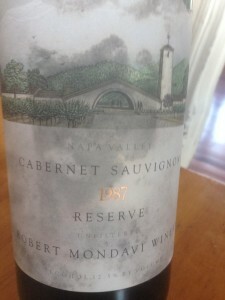 I was concerned about the Mondavi Cabernet Sauvignon before opening it, but not once it was open. 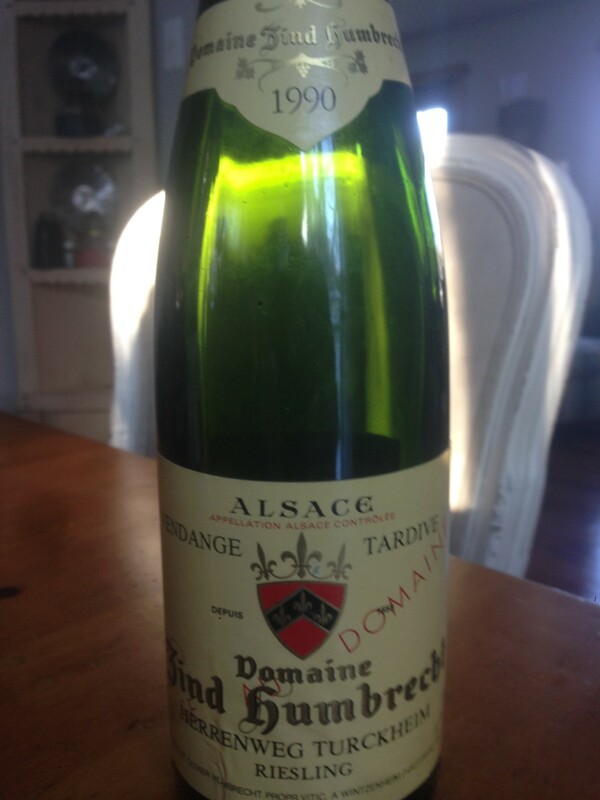 I had expected the 1990 Zind Humbrecht to be drying out and losing some fruit, same as I had expected to see the 1985 Moulin Touchais losing momentum, but both were in great shape, and the Moulin Touchais is actually still continuing to improve with age, even at 32 years of age. Wine tasting can be such good entertainment and so conducive to enhanced and enriched social interaction, in short – good times. So keep buying those bottles, store them properly, and know when to bring them out and enjoy. Cheers, and here’s to a Happy New Year!